2013 is the year of me trying new things; Brussels sprouts, avocado and guacamole, and now crocheting. The verdict is still out on how I feel about crocheting. 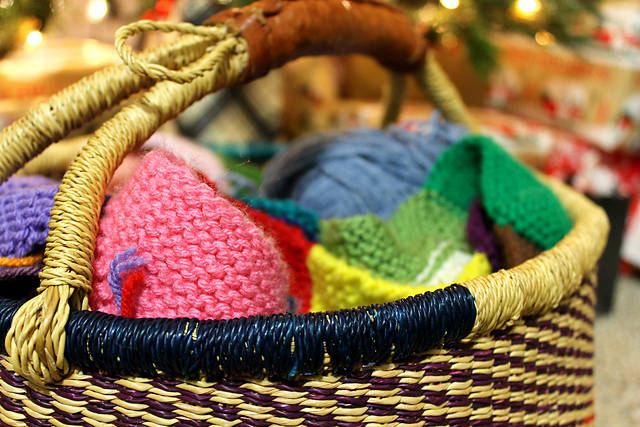 At the moment I definitely prefer knitting. ETA: Oh yeah, I finally learned how to do an i-cord as well! So yesterday we did that pin that I’m sure y’all have seen on yonder Pinterest where you write on a mug with a Sharpie. I hope they wash well. Another “Why didn’t I think of that?” crafty thing. 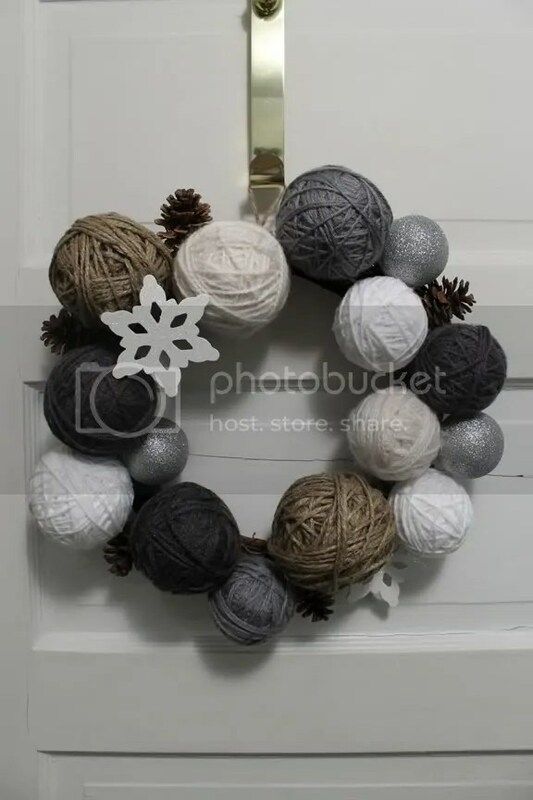 I came across Wrap yarn around a door, clothes pin Christmas cards on it about a month ago on Pinterest and filed it away under my Annual Gift Day board. We decorated for Christmas on the 1st but had only one card at the time. Then last week we started getting more cards and we were trying to think of how to display them. One of us remembered the pin. I dug around in my stash and found some forest green yarn. Bought some clothes pins and Voila! 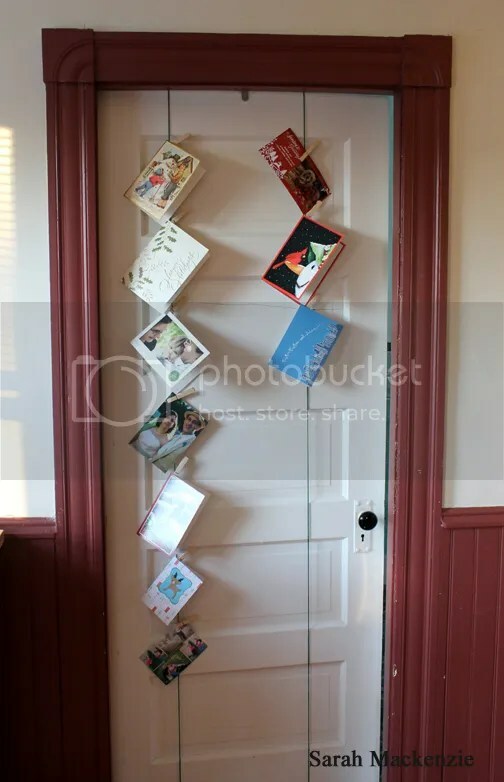 a cute holiday card display. I’m not ready for this! 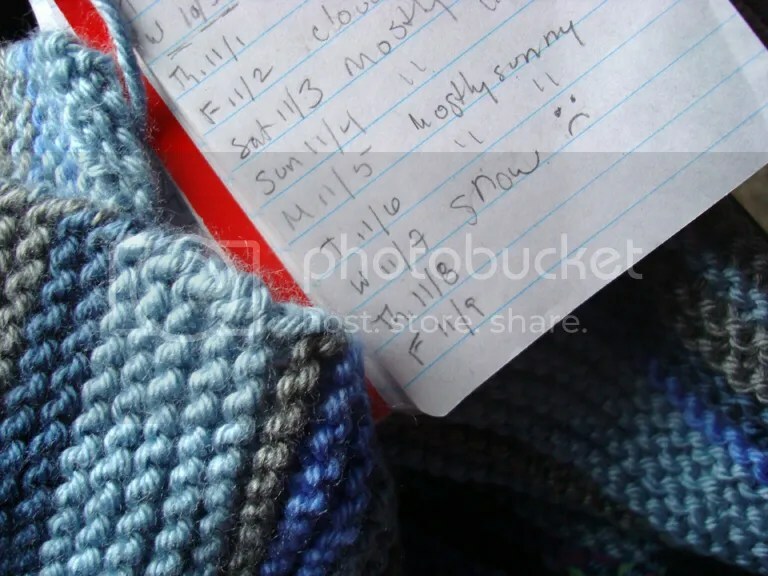 Keeping track of the sky and wrote down something I’m not ready for. I’m liking the scarf more now that I’m redoing it at slightly narrower width. The edge is looking better as well. Details here. The shot of the scarf on the coffee table is the newest redone image (I’m trying to redo the images to match what I’m doing now). Our 4 year anniversary was this past weekend. Harry made my card once again. Today Harry and I had an art date. We had one a few months ago and he’s been wanting to do another one for a while. Since it’s a long weekend and we had no plans, today was a perfect day for it. You can read about what Harry drew here. For those who really know me, yes it’s a big step to share my drawings. I am not confident in my drawing skills at all, despite years of art classes as a youth, and my mom being a former Art teacher. I really like the brush pen. It flows very nicely. I’ve craved Bun Thit Noung Cha Gio for about a week now. (By the way…probably my favourite food ever. I could eat it all the time. So good!) 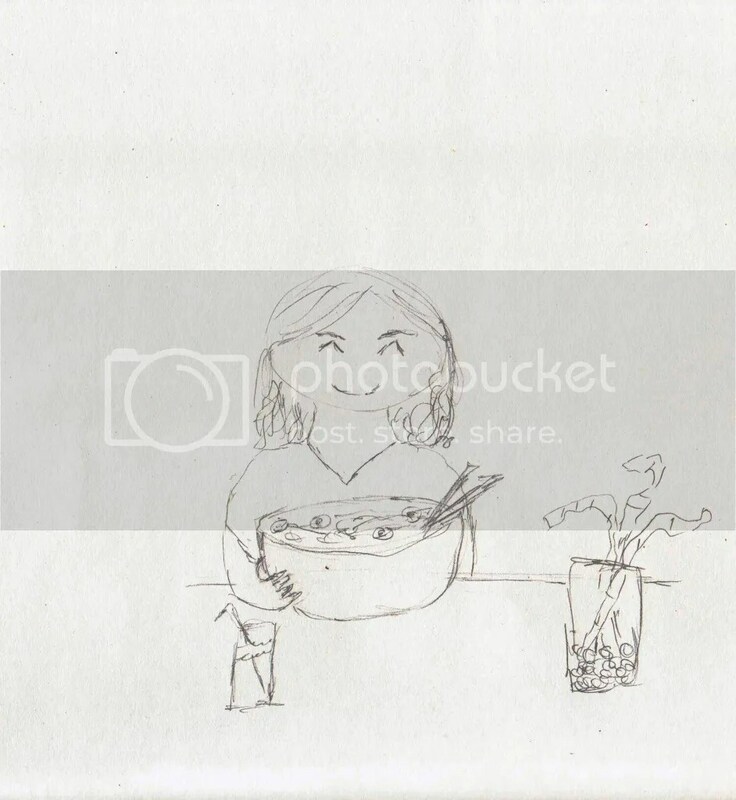 So I drew myself getting a big bowl of it at Vohn’s, our favourite Asian food restaurant. 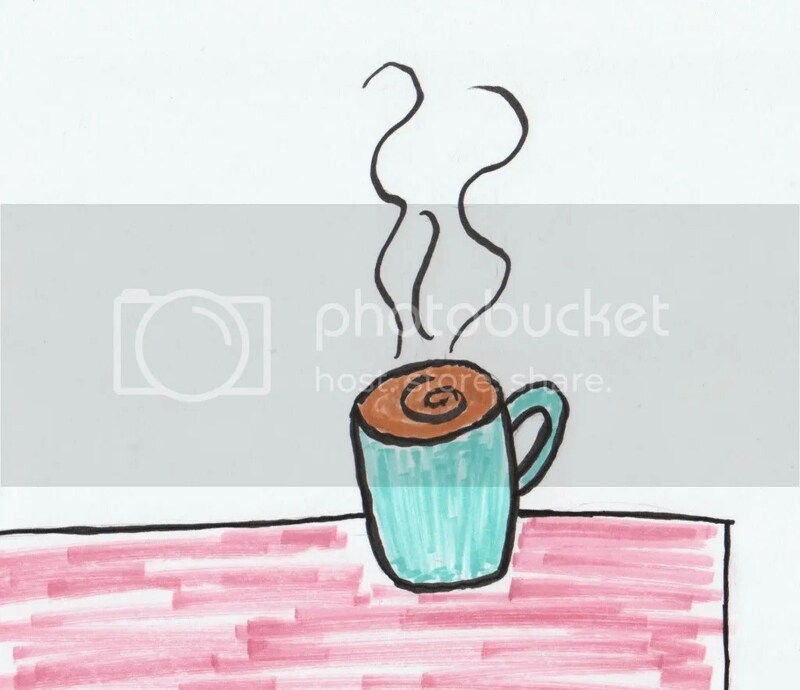 Lastly, I have a little still life of one of my favourite things…coffee. Eh, it’s okay. I agree with Harry that Le Plume markers are kinda crap. I don’t like them at all. They are what I used for the blue, brown and pink. For the mug, swirl and steam I used the brush pen. For the outline of the table I used the graphic pen. I see a trip to ASW during Harry’s vacation time to check out some alcohol based markers. I first saw this wreath a few months ago on Pinterest and quickly pinned it for myself. I love that it’s wintery, not just Christmas. I really like the use of neutrals (which is normally not my bag). We started working on it at the beginning of December and finally finished it today (nothing like a snow day to do some crafting). After some complications trying to use foam tubing for plumbing as the wreath form (weight of the balls was too heavy for the foam), we decided to go with the good ol’ grapevine wreath. I recently came across a pin on Pinterest for a DIY message board. 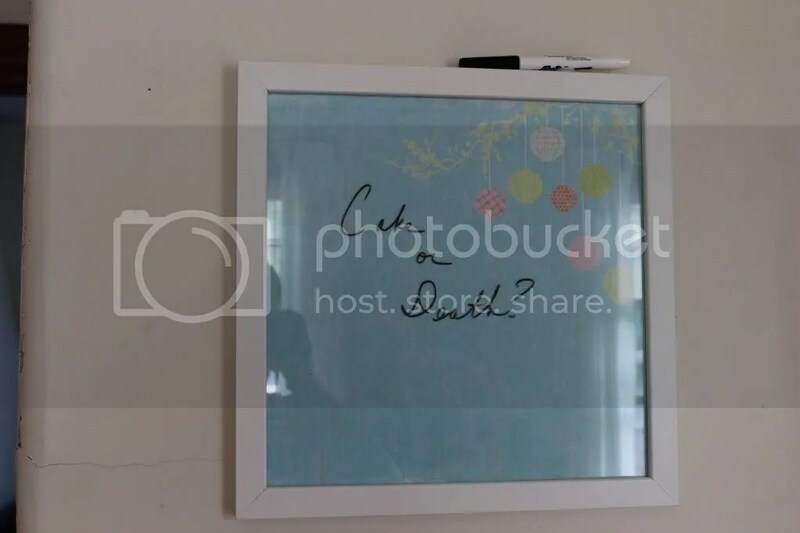 I have not been able to find a magnetic chalkboard like we had, so I thought this would be a good alternative. A few days ago I went to the craft store and found the frame and a piece of pretty paper. Today Harry put it together and hung it up. After dropping him off at work I had errands to do so I picked up a marker, eraser and small Velcro dots (w/ sticky backs). Voila! Since it’s just a piece of scrapbook paper it is easy enough to change out the design any time we want or for special occasions. 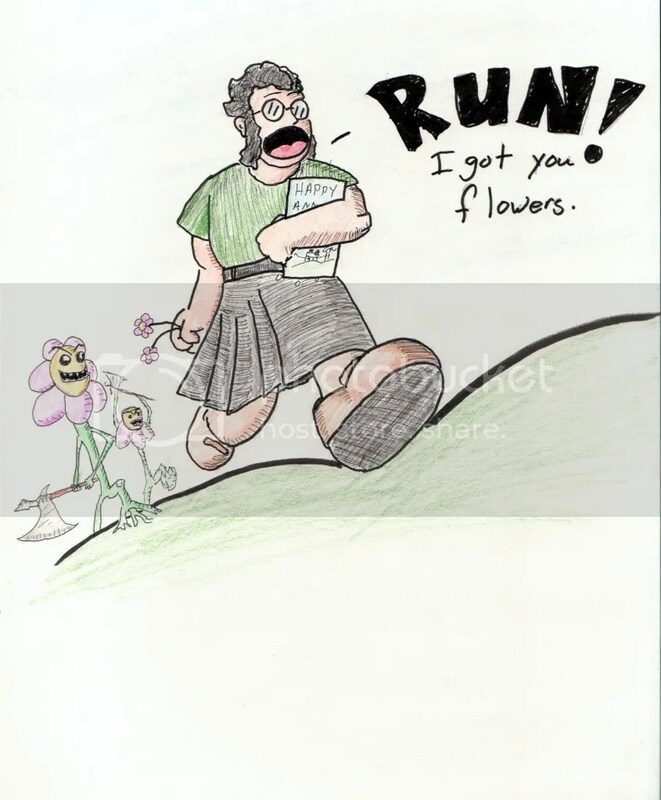 I just had to share the card Harry made for me for our 2nd anniversary. 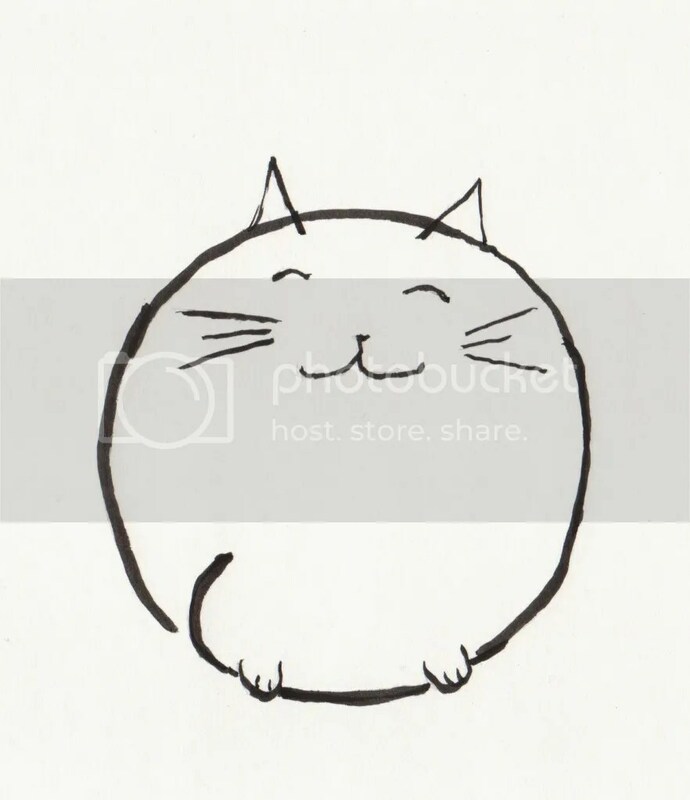 We had bought an embellishment for scrapbooking that is pretty much that image. I like how he made ‘us’ look the way we do now. Fran Prix is the grocery store we went to in Paris to get water, baguettes, etc. He even included his customary Cthulhu and panda heads. ^^ This was the first time he made a card like this! I am so impressed!